One of the great advantages of food trucks is that owners are on the truck daily. This brings a tight bond between the owner and their hungry patrons. Since many of us only get that small time between ordering and grabbing our food, I wanted to help bring us together. That’s when I got the idea, Behind The Wheel. Gets me back to telling the story and further enjoying – being around food trucks. 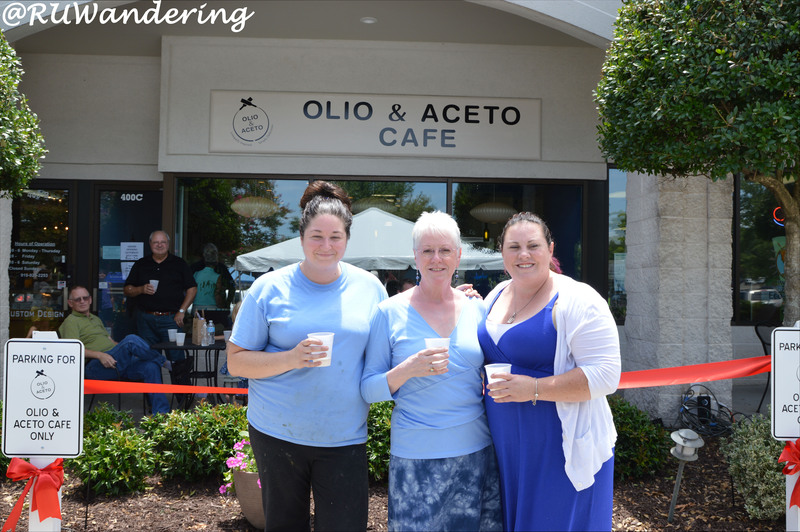 This week I highlight Olio and Aceto. If you had truck withdrawals, the truck was there, too. One of my favorite big cities is Chicago. I have a lot of fond memories reuniting with friends and eating great food. Though its not just my friends who travel to Chicago with me that I enjoy. There is something about people who live in the Midwest that I enjoy. 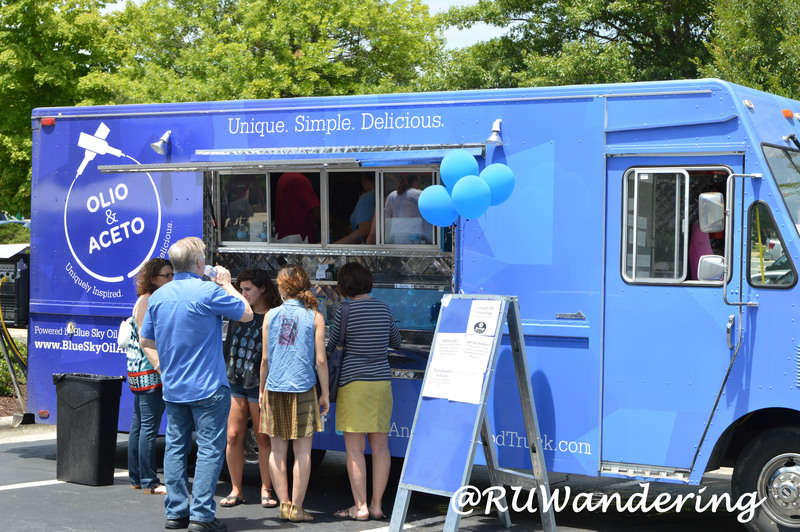 When I see Olio and Aceto parked, the dark blue color on the truck brings a friendly, serene feeling. Its almost like I am revisiting those warm feelings I had for Chicago. But its not only the truck’s color, its the chefs behind Olio and Aceto. Friends who met in the business that strengthened their friendship when one moved down to North Carolina. When you meet Suzie Keenan, executive chef, and Megan Olerich, sous chef, they won’t only warm your heart, they will also warm your belly. Megan, Glenda, and Suzie at the cafe’s grand opening. Rumor has it, people didn’t think you’d be friends at day one? Before Megan became the Pastry Chef at the restaurant Suzie was one of the Kitchen Manager, it was rumored they didn’t think you’d get along. But within days, the two of them became great teammates and friends. However, they didn’t become better friends until Suzie left the restaurant. 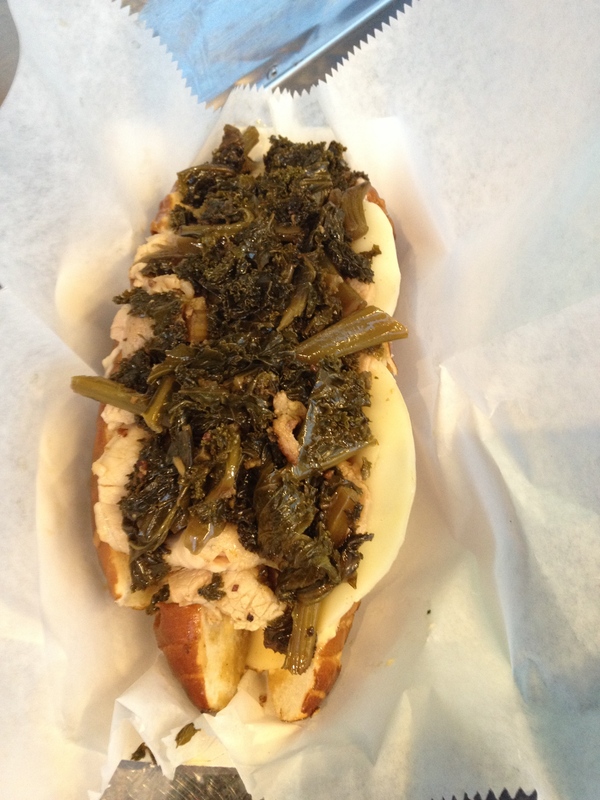 Pork Loin Sandwich- Maple Pork Loin, Braised Kale, Provolone and our Signature Mayo on a Pretzel Roll. So, how does one travel from Chicagoland to the Triangle? Part of the reason Suzie came down to Chapel Hill was to help her mom with Blue Sky Oil and Vinegar. Glenda, Suzie’s mom, became ill and Suzie took on responsibility. Then Suzie came up with the idea to use Blue Sky products as key ingredients for a restaurant. The concept: an extension to the retail shop. Unfortunately, that idea wasn’t possible at the time. However, the Triangle had a growing food truck scene. So, Suzie thought about running a food truck with the Blue Sky concept. But before she wanted to expand she wanted to call on someone who’s work ethic and ideas she trusted. She called on Megan to be the sous chef for Olio and Aceto. Megan wasn’t sure, because Chicago was a good part of her adult life. Though she noticed the industry scene was a different scene than she wanted to be in. She also noticed that the Triangle had a different pace and saw some things she liked. During a two week visit, she decided to take Suzie’s opportunity. 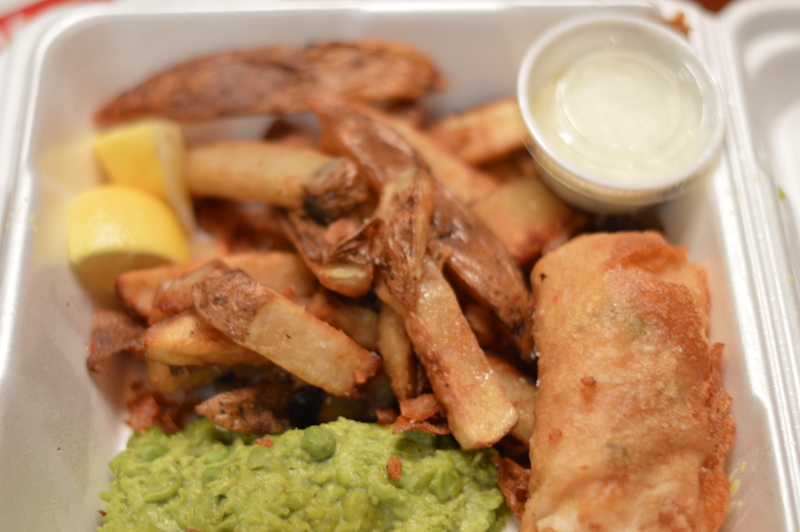 A Fortnight special, Fish and Chips complete with mushy peas. I don’t live near Fortnight and I will drive out of my way to order them. Where does the name “Olio and Aceto” come from? Contrary to what some may believe, it is not the girls’ nicknames. “Olio” (OH-lee-oh) is for Oil and “Aceto” (AH-ce-to) is for Acid, playing homage to those key ingredients at Blue Sky Oil and Vinegar. Although, I wonder who would be Oil and who would be Acid. Southern BLT and a Moravian Rhapsody from Raleigh Brewing Company. 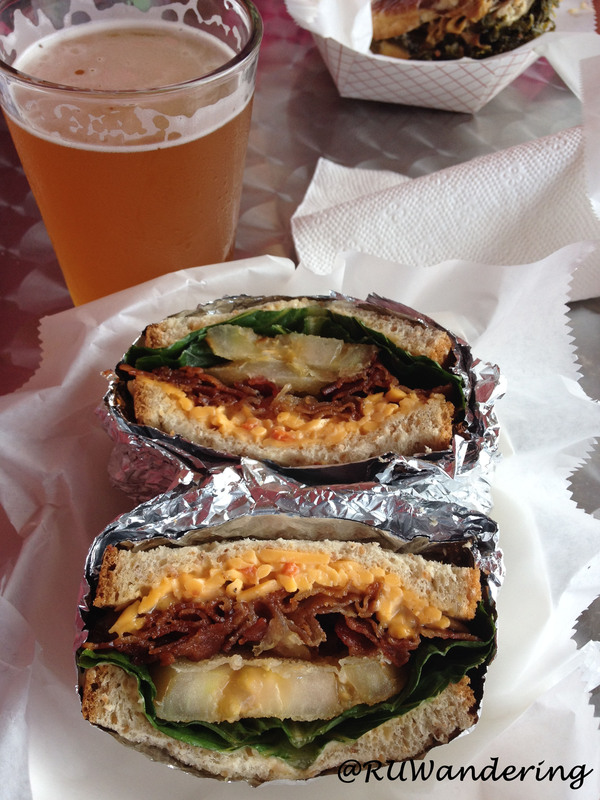 You can typically find Olio an Aceto’s food trucks at many local breweries. We know about Blue Sky Oil and Vinegar, but any other interesting ingredients? They do source from local suppliers. For instance, those that enjoy gluten-free options Olio and Aceto uses products from Moonflour Bakery in Raleigh. This also includes their signature Southern BLT, which uses locally grown green tomatoes. I particularly enjoy how they incorporate local beer into their menu items. This was very apparent in their Beericana menu highlighting beers present at the event. 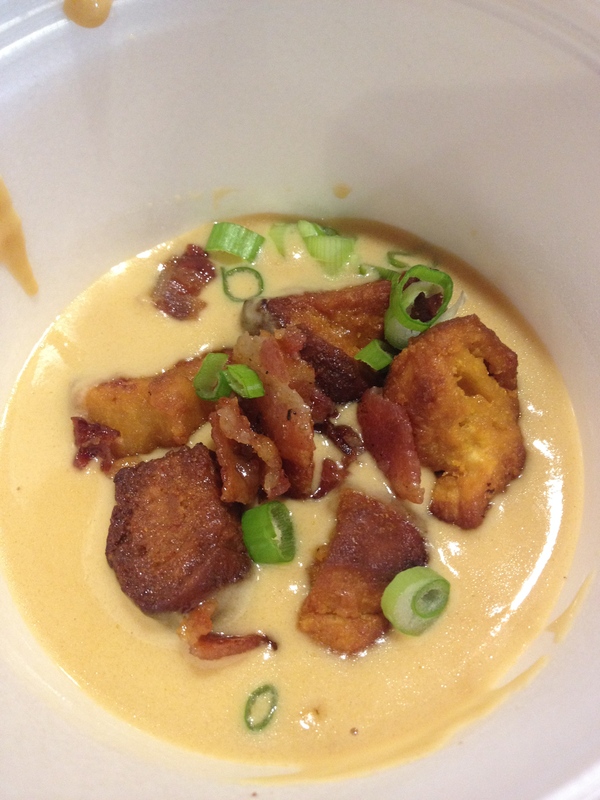 A Midwestern favorite, beer cheese soup. If this is the Soup of the Day, I’d recommend this reminder of my time in the Midwest. With the recent opening of the cafe, how different is the cafe to the truck? The cafe menu has variations of some of the truck’s favorites, but it also has some classic brunch and breakfast items. The food truck has a separate menu that tailors more to the events and breweries it visits. The cafe also hosts wine dinners. Typically, these are 4 course dinners with wines specifically picked for these courses. These events will highlight these chef’s artistry in a more sophisticated and intimate setting. Interesting Fact: First dollar at the cafe, from a Health Inspector! Also, a sneak peek at a Food Truck Holiday List I’m putting together. Check out Glenda’s cookbook Blue Sky Cookbook, Cooking with Olive Oil and Balsamic Vinegar recipes. Some of the food truck’s inspirations are here.